Ichimoku Cloud (or Ichimoku Kinko Hyo) is a technical analysis method that combines leading and lagging indicators with traditional candlestick charts in order to provide a comprehensive trend trading system. Developed by Japanese journalist Goichi Hosoda in the 1960s, Ichimoku Kinko Hyo is translated as "one balance equilibrium chart", while the common name of Ichimoku Cloud refers to its appearance. Ichimoku can be displayed as a separate indicator in Minute, Hourly, Daily, Weekly or Monthly format. Often referred as the Conversion Line, Tenkan-Sen is simply the mid-point of the latest 9 trading days/periods — the average of a 9-day High and 9-day Low on a daily chart. Kijun-Sen, or Base Line, is the mid-point of the latest 26 trading days/periods. The two lines (Tenkan-Sen and Kijun-Sen) are used in a similar fashion to fast and slow moving averages. Senkou Span A is the mid-point between the first two lines, Tenkan-Sen and Kijun-Sen, but plotted 26 days/periods ahead of the current period. Senkou Span B is the mid-point between a 52-period High and a 52-period Low and is also plotted 26 days/periods in the future (ahead of the current day). Chikou Span is simply the Closing Price, but plotted 26 days/periods in the past. The trend is upward when price is above the Cloud. The trend is downward when price is below the Cloud. The trend is flat (undetermined) when price is in the Cloud. The Cloud is green when Senkou Span A is above Span B. 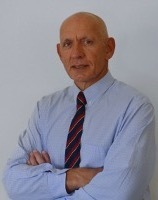 A predominantly green cloud indicates a strong up-trend (or weak down-trend), while a predominantly red cloud indicates a strong down-trend (or weak up-trend). Signals above the Cloud where the latest Cloud color (ahead) is green are stronger than where the color is red. Go long when Tenkan-Sen (blue) crosses above Kijun-Sen (red). Go long when Price crosses above the Kijun-Sen (red) line. Exit when Price crosses below Kijun-Sen (red). Exit when Tenkan-Sen (blue) crosses below Kijun-Sen (red). Signals below the Cloud where the latest Cloud color (ahead) is red are stronger than where the color is green. Go short when Tenkan-Sen (blue) crosses below Kijun-Sen (red). Go short when Price crosses below the Kijun-Sen (red) line. Exit when Price crosses above Kijun-Sen (red). Exit when Tenkan-Sen (blue) crosses above Kijun-Sen (red). The S&P 500 index is plotted on a weekly chart with Ichimoku Cloud. Price above the Cloud indicates an up-trend. The first buy signal is when the blue line (Tenkan-Sen) crosses above the red (Kijun-Sen), after the green Cloud indicates the trend is firmly established. The second long entry (if pyramiding) is when Price closes above the red (Kijun-Sen) line. Again, the green cloud indicates an established trend. 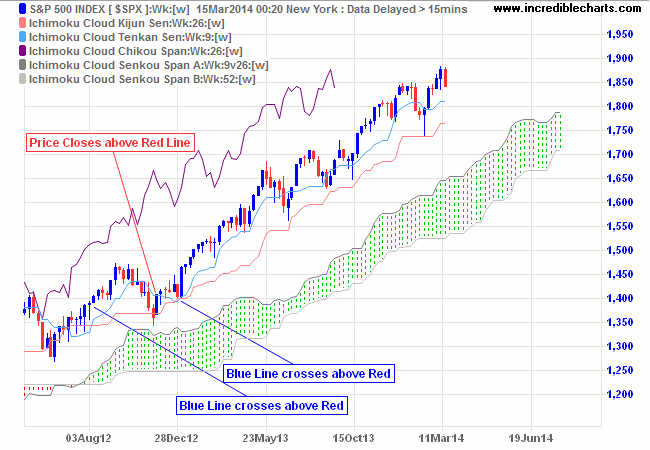 A third entry signal is available when the blue line (Tenkan-Sen) again crosses above the red (Kijun-Sen). Exit if Price closes below the red line (Kijun-Sen) — or the blue line (Tenkan-Sen) crosses below the red. 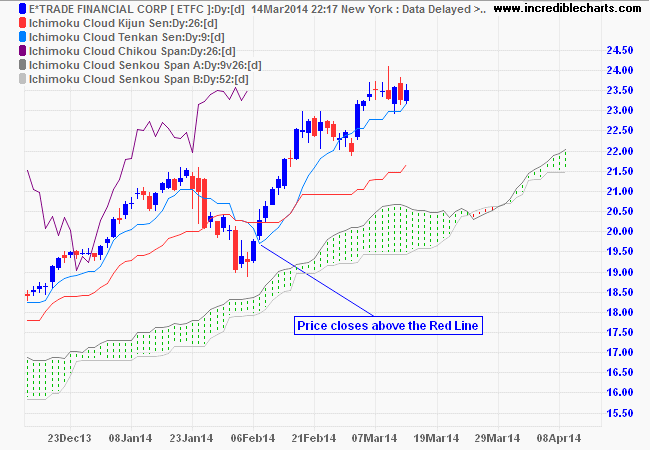 Etrade Financial Corporation [ETFC] is plotted on a daily chart with Ichimoku Cloud. Price above the Cloud indicates an up-trend. Enter long when Price closes above the red (Kijun-Sen) line. The green cloud indicates an established trend. Exit if Price closes below the red line (Kijun-Sen) or the blue line (Tenkan-Sen) crosses below the red. How to identify a strong trend: the blue line does not cross below the red. In a strong trend, short-term traders may find that crosses of the red (Kijun-Sen) line are few and far between. Consider long entries where Price closes above the blue (Tenkan-Sen) line and short entries (in a down-trend only) when Price closes below the line. 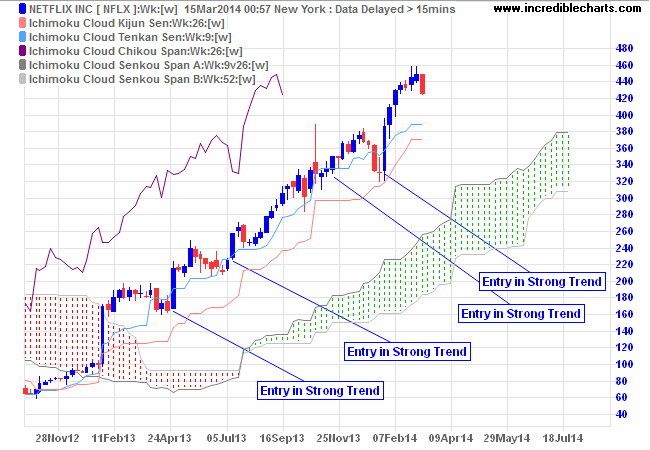 Netflix [NFLX] is plotted on a weekly chart with Ichimoku Cloud. Price above the Cloud indicates an up-trend. The blue line (Tenkan-Sen) holding above the red (Kijun-Sen) indicates a strong trend. Enter when Price dips below and then closes back above the blue line. Exit if Price closes below the red line (Kijun-Sen) or the blue line (Tenkan-Sen) crosses below the red. Not used as much, but if the purple line (Chikou) crosses above Price, that is a long-term buy signal, while a cross below Price is a long-term sell signal. Select Indicators and Ichimoku Cloud in the left column of the Indicator Panel. See Indicator Panel for directions on how to set up an indicator. To alter the default settings - Edit Indicator Settings.